At the Dan Barber talk I attended a few weeks ago, Dan expressed his belief that it is the stories behind the food we eat—the stories of the seeds, the land, the farmers, the cooks, behind every dish—that make it all that more valuable to us. I thought about this last night when I received an email from my longtime friend Nick Capote (the same friend who taught me all about the science of deep frying back when we were both in high school). In his message, Nick excitedly announced that the documentary he and his team have been working on for the better part of a year is finally going to be airing nationwide this Sunday night on Dateline. Called Children of the Harvest, it tells the story about migrant farm workers—the invisible hands in America’s food-supply chain. Specifically, it tells the story of the many children, as young as five and six, who work alongside their struggling parents in the fields harvesting the food that we eat every day. 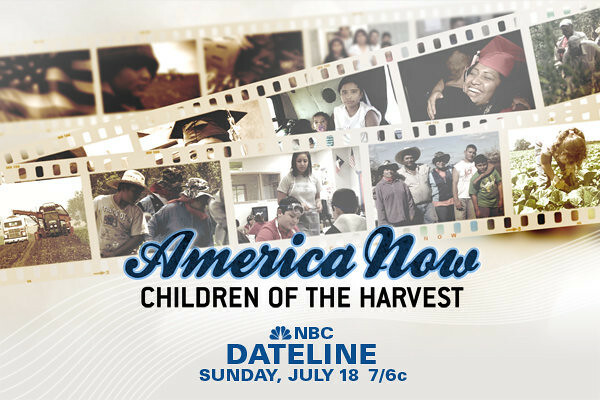 The documentary intimately follows the journey of ten-year-old Ulysses Cruz, a young boy whose life has been dictated by the cycle of the crops, and other children under 12 doing work forbidden by child labor laws. It’s an important story for all of us to know, and I hope you’ll join me in watching it on Sunday evening. Read more about the documentary on the Dateline website.